Sarcoid Salve by CareFree Enzymes is an ALL natural, highly effective, herbal product that is used to help remove sarcoids and encourage normal hair growth. CareFree Enzymes has been a trusted name, since 1995 as the trusted manufacturer of natural enzyme products. We have a range of products for the: Outdoor Birding, Water Garden, Home/Pet, & livestock industries. Our enzyme products are Eco-friendly and safe for pets, livestock and wildlife. Currently, there are no products on the market which are as strong or safe as CareFree Enzymes. All products are made in the USA and employees live here in the USA! Why Is The Name “CareFree” Enzymes? We call ourselves “CareFree Enzymes” because our enzymes do the work, so you don’t have to. For example; when you use our enzymes in a fountain, the enzymes will keep the water clean and pumps flowing. In other words, when you add our enzymes to your fountain, that fountain becomes "Care-Free" because it will no longer need weekly maintenance. Our enzymes will keep your fountain looking brand new and running properly all summer. Sarcoids are the most common skin tumour in horses and ponies and, although they may look like warts, they are locally destructive and are therefore considered by many vets as a form of skin cancer. They are most often found on the abdomen, inside the back legs, around the sheath, on the chest and around the eyes and ears. They also often appear at the site of old scars, particularly on the legs. These are sites where flies typically congregate and insect transmission is thought to be involved in the development of the condition. Can Any Horse Get Sarcoids? Young to middle-aged horses are most commonly affected and there may be a genetic predisposition. It is a condition that is unique to horses. Sarcoids can appear singly as tiny lumps or in clusters. As they enlarge, the skin may ulcerate and become infected. In summer, they attract flies and can end up as open sores which will not heal. The veterinarian’s challenge. Once corrective measures are taken, the virus may travel to other points and come back more aggressively. For the horse owner, this virus can be devastating. CareFree Enzymes Offers a REAL Solution For Horses Suffering With Sarcoids! Sarcoid Cleansing Salve Will not burn, heals hot spots and eliminates tumors at their source. Our Sarcoid Cleansing Salve pulls the virus from the bloodstream. Recommended as a pre and post-surgical emollient. Use as a preventative measure so that a sarcoid tumor will not reappear. It is the new, safe way to establish an aggressive, painless and effective treatment of this ever-increasing problem. The Sarcoid Cleansing Salve is specifically designed to help clean the underlying cause of the condition through topical application. Our product is made from natural compounds blended to perfection to treat this condition. Note: ALL of our products are made with natural enzymes and plant oils without the use of ANY harsh chemicals. When used as directed, they are completely child & animal safe. Is It True That CareFree Enzymes Uses Natural Enzymes and Is 99% Organic? Yes! Our product lines are like no other. Each of our products is a unique blend of Natural Enzymes which fulfill a specific need for our customers. Before we ever take a product to market, we do thorough R&D testing which often takes years to perfect. We do this so that ALL of our products achieve 100% customer satisfaction. We pride ourselves on making products that are safe, & affordable while also working exactly how they are intended to. Nothing is better, safer, or as cost effective as our enzyme products. Our products are 99% organic! What If I Want To Become A Distributor for CareFree Enzymes? There is an enzyme for every situation. Some of the uses for our products include: parasite control for livestock, water cleaning, sanitation, & odor control. We put tremendous thought into every product we make and stand behind their efficacy. Along with our unique enzyme products we also make products using natural live bacteria, essential oils, and D.E. Currently, we are primarily focused on finding distributors for our Water Gardening, Mosquito Free Water and Pet products. Call us today and we will make a wonderful addition to your business! 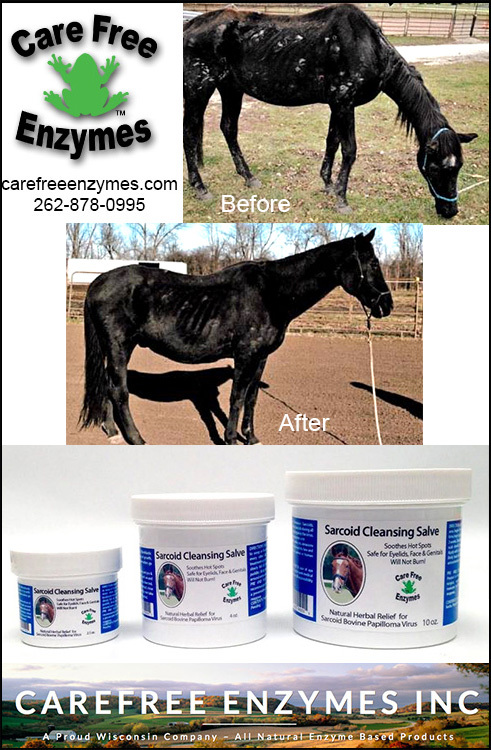 CareFree Enzymes Offers A Naturally Healthy and Effective Way To End Sarcoids! In case you were wondering— there is NOTHING like CareFree Enzymes on the market today! Our Sarcoid Cleansing Salve pulls the virus from the bloodstream! Recommended as a pre and post-surgical emollient. Use as a preventative measure so that a sarcoid tumor will not reappear. It is the new, safe way to establish an aggressive, painless and effective treatment of this ever-increasing problem. The Sarcoid Cleansing Salve is specifically designed to help clean the underlying cause of the condition through topical application. Call and order today and let us help make your horse a ’sarcoid free’ healthy horse!